AAEA Hollywood: An Inconvenient Truth: Gore Fooling Us Again? Fool me once, shame on you. Fool me twice, shame on me. Ex Vice President Al Gore is coming around for a third time so I guess it is shame on all of us if we fall for his fake one more time. 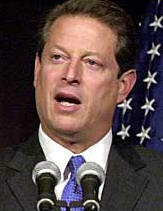 When Vice President Gore was in Washington, DC he ran from his Ozone Man label like it was the plague. He did not agree to go to Kyoto for the Protocol until the last minute and that was after much criticism from the mainstream environmental movement. He evidently could not convince President Clinton to even send the Kyoto Treaty to the Senate for consideration. And now he is mister 'environmentalist' again. Hmmmm. Isn't another presidential election looming? Hillary Clinton is better on the environment than Gore. And she has not faked us out. George Bush is better on the environment than Al Gore but the media and the mainstream environmental movement will never give him that credit. John McCain is better on the environment than Al Gore. Rudy Guiliani is better on the environment than Al Gore. So we will go to see his new campaign commercial, but don't think we will be fooled again.